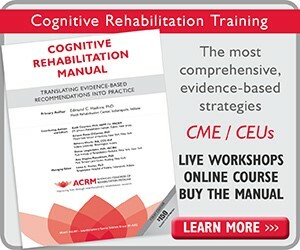 ACRM has the Pediatric Rehabilitation Science from ACRM.org on Vimeo. 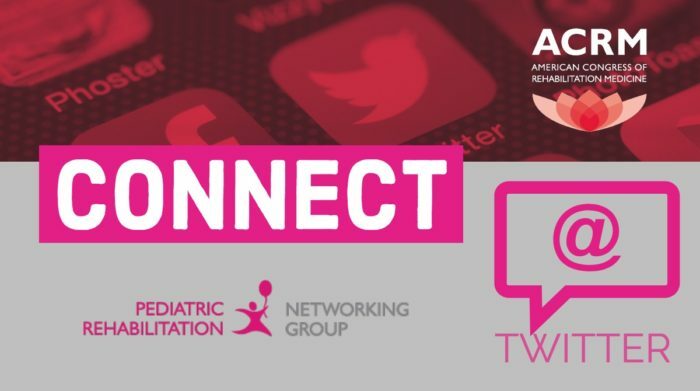 The ACRM Pediatric Rehabilitation Networking Group (PRNG) invites your participation. 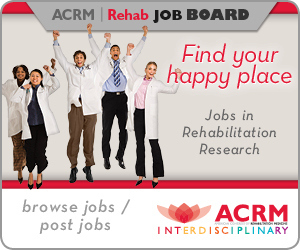 Help identify the critical rehabilitation issues this group will address, recruit colleagues in the field, or step into a leadership role as chair of a task force. Our mission is to facilitate meaningful interdisciplinary work that enhances the life of children and adolescents with functional limitations. The collaborative work of the PRNG members is meant to help develop well defined interventions and outcomes, prevent further impairment, reduce activity limitations, and minimize participation restrictions while maximizing growth and development of each child/adolescent served within the family, school, and community. Contact Co-Chairs, Angela Hein Ciccia and Cristina Sadowsky to learn more. Follow, heart your fave posts, retweet and show your support for #Pediatric #RehabResearch. In collaboration with Case Western Reserve University, the Pediatric Rehabilitation Networking Group is recording a series of podcasts to highlight the personal journeys of pediatric rehabilitation professionals to inspire your own path and enhance a sense of professional community. Your host, Dr. Angela Ciccia will feature guests across various areas of specialty and delve into what drives and motivates each guest in their daily work-life. Join us! PRNG member, Sathya Vadivelu, has a goal to build programs based on the needs of her local community that are not only sustainable, but also inspire others to set new standards in patient care. She has been inspired by many people and programs during her training and hopes her work will be an inspiration to others. Join a Task Force or 2018 Work Group! We are looking for PRNG current and “wanna be” members who are interested in pediatric outcomes. Documenting meaningful functional outcomes in pediatric rehabilitation is challenging and, frequently, disease specific. Long term follow up is challenging, given the multitude of scales and measuring tools, their reliability and validity, age and diagnosis specificity. This task force’s main goal is to create a comprehensive list of validated outcomes, disease and age specific and propose a streamlined approach for long term functional follow up. Technology is developing at an extremely rapid pace. There is an opportunity to leverage this technology to improve patient care as long as we understand the capabilities and limitations of the available technology and identify patient needs. This task force was put in place for a specific purpose: to maximize the therapeutic potential of technology in pediatric populations with disabilities. The mission of the task force is to facilitate the development and integration of technology in the assessment of functions and symptoms as well as in the delivery of therapeutic interventions in pediatric populations with disability. To that end, the group will first develop a list of priority areas within which technology could have a significant impact. We will then review the currently available scientific evidence and identify knowledge gaps as well as present challenges and opportunities on how to use the technology. First Project: Literature review related to activity/exercise monitoring in pediatric populations with disability, and with that knowledge identify gaps and present challenges and opportunities on how to use the technology. Write a paper including our findings. Timeline: Literature Review done by July. 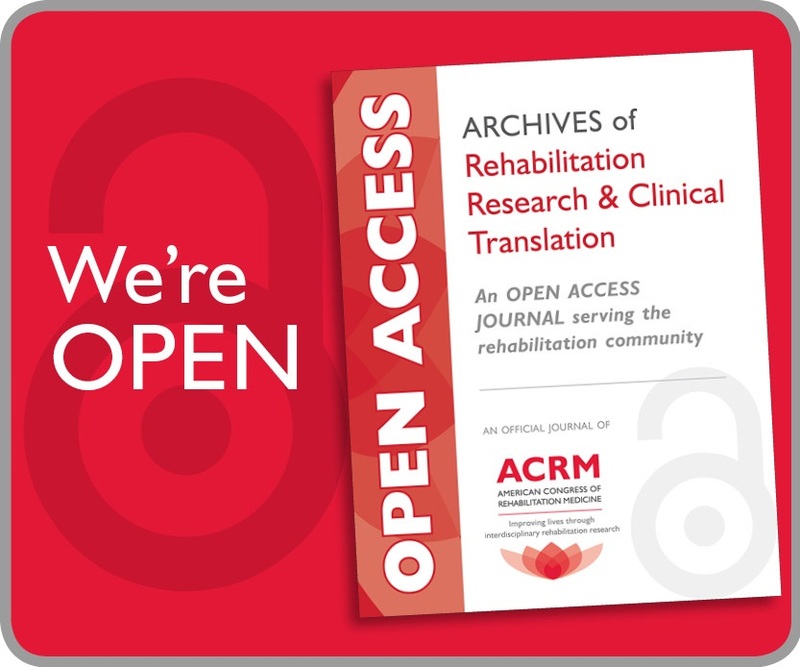 Paper submitted by the time of the ACRM conference in September/October 2018. 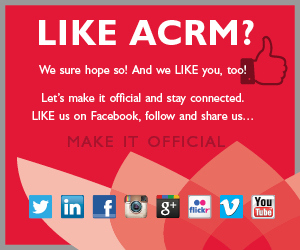 First official in person meeting: ACRM 2018 Conference in Dallas, September/October (date TBD). Source America: manages $10 billion (12% of the national budget) with mission to employ people with disabilities. The PRNG is proud to sponsor a Special Symposium for pediatric rehabilitation featuring Amy J. Houtrow, MD, PhD, MPH. Her presentation, Access to Care for Children with Disabilities, will provide a state of the science for children with disabilities and will discuss opportunities to improve health and functioning outcomes for this population. This symposium will be held during the ACRM 2018 Annual Conference in Dallas, Texas, 30 September – 3 October at the Hilton Anatole. See the Online Program for lecture details & REGISTER now for best rates. Dr. Houtrow is an associate professor and Vice Chair in the Department of Physical Medicine and Rehabilitation for Pediatric Rehabilitation Medicine University of Pittsburgh School of Medicine. She is also the Vice Chair for Quality and Outcomes. She directs the ACGME accredited Pediatric Rehabilitation Medicine Fellowship and is the Chief of Pediatric Rehabilitation Medicine Services at Children’s Hospital of Pittsburgh of UPMC (CHP) and the Medical Director of the Rehabilitation Institute at CHP. Dr. Houtrow is Board certified in Pediatric Medicine, Physical Medicine and Rehabilitation and Pediatric Rehabilitation Medicine. She earned her MD from Michigan State University, her MPH in health policy from the University of Michigan and her PhD in medical sociology at the University of California, San Francisco. As a researcher, she collaborates on clinical outcomes research and conducts health services research examining how children with disabilities and their families interact with the health care system, factors associated with health services inequities, disability trends and impact on families. Her research uses large administrative datasets, national surveys and condition specific cohorts. Dr. Houtrow is a national leader serving on numerous committees including as Chair of the National Academies of Sciences, Engineering and Medicine’s Committee on Improving Health and Functional Outcomes for Children with Disabilities. The Pediatric Rehabilitation Networking Group is pleased to recognize Benjamin Greenberg, MD, MHS, with the 2018 Pediatric Rehabilitation Award for his outstanding contributions to the field of pediatric rehabilitation. Dr. Greenberg is an internationally recognized expert in treating adults and children with autoimmune disorders of the central nervous system. He specializes in treating patients with transverse myelitis (TM), neuromyelitis optica (NMO, or Devic’s disease), and multiple sclerosis (MS). 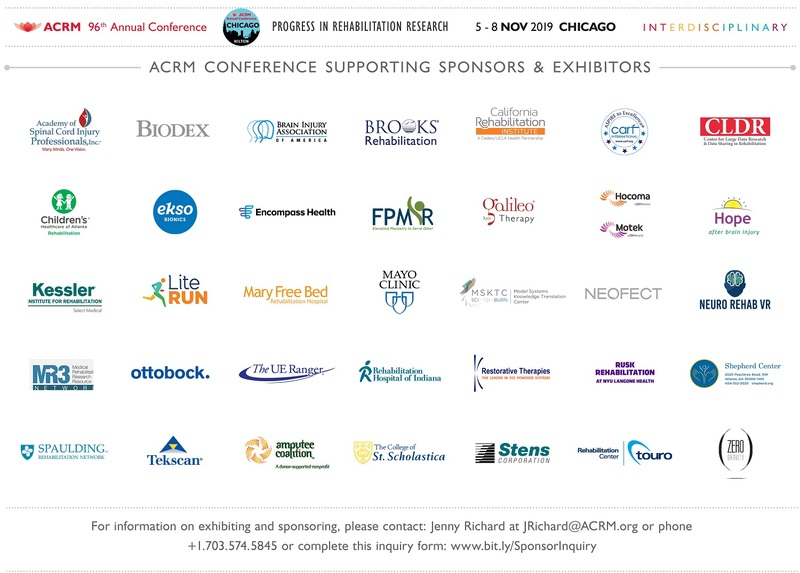 Dr. Greenberg will present an award lecture during the ACRM 2018 Conference on the differential diagnosis, evaluation of and various etiologies of myelitis. See the Online Program for lecture details & REGISTER now for best rates. Dr. Suskauer presented the award lecture, Pediatric Concussion: What Science Tells us About the Art of Management at the ACRM Annual Conference in Atlanta, GA on Thursday, 26 OCT 2017. Dr. Vogel was the inaugural recipient of the Pediatric Rehabilitation Award and presented the lecture, Long-Term Outcomes of Pediatric-Onset SCI, to a standing-room-only audience. 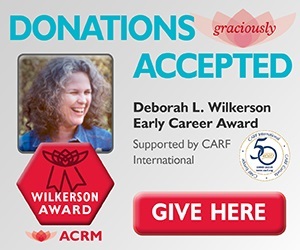 DONATE BY CHECK made payable to ACRM. ADD: “Mark Ylvisaker Lecture Donation” in the note field. Continue through remaining screens to receive confirmation that your donation was received. *For credit card payment, please ensure the billing address entered matches the billing address for the credit card account. Our security filters perform an address verification process and the payment will not go through if the billing addresses doesn’t match.